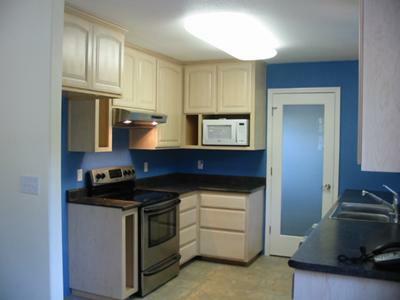 This cobalt blue kitchen is in my brother's house. Because he wanted to build maple cabinets and use a light bleached finish, I felt that the color of the walls could be a bit stronger to set off the light cabinets. I looked around the internet for some paint color inspirations and found that most of the shades used were muted. But these were voted down in favor of a more cheerful and active style. It was a bit of a battle deciding what color to do. We quickly ruled out using reds or yellows, and green seemed too tame. Before installing the cabinets, we primed the walls with Kilz and then rolled on one coat of Glidden "Gulfside" - this cobalt blue color in eggshell finish, and touched up any spots that came out looking too thin. Of course, we measured and marked the walls so that we didn't waste time and paint behind where the cabinets were going to go! It took just under a gallon to do the small surface area and went pretty quickly. Touch up was done with a brush the next day. Initially, we had the wrong color florescent in the light fixture - warm instead of cold - which was a bit of a mood clash. After the painting was done, our neighbor erected a play structure right out the window over the sink, with an awning almost exactly the same color blue! We joke that they were kind enough to coordinate their yard with our kitchen. I always like to have light colors on the ceiling to reflect light and draw a distinct contrast with the color of the walls. The white sort of acts as a foil and a sustained element throughout the different rooms and their color patterns. The rest of the downstairs has a medium beige/peach shade that we have used in many of our houses, Bower's Beach by Behr, and white trim. I was searching online for ideas on how to do my kitchen, we are fixing to remodel, and I came across this post. I think I've found just what I want to do! This is a beautiful kitchen and especially the wall color and I hope mine turns out as pretty as yours! This kitchen looks amazing, the color combination highlights the furnishings very well.